Exactly four years ago we moved into our fixer upper dream home. One of our favorite features of our home was the size of our backyard. 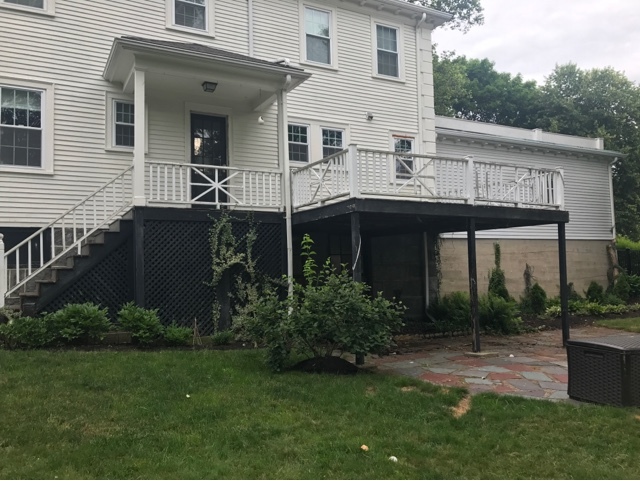 Back in the day, this country girl would have laughed if I said this backyard was big but for Boston suburb standards, it's a decent sized yard. Now don't get me wrong, this wasn't some amazing manicured lot. 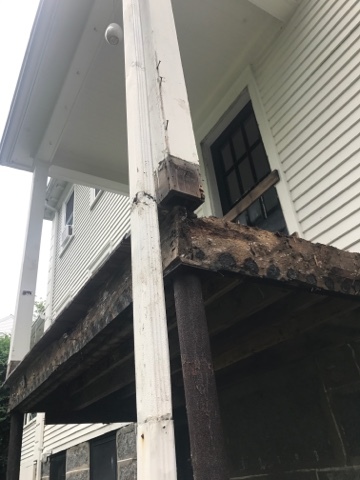 In fact the deck was so rotted the inspector told us not to even walk on it. There were random plants in the middle of the yard, everything was overgrown and the property is surrounded by massive trees. The trees in the front of our house are what made me fall in love with our neighborhood. Picture father of the bride. Those trees are staying and I hope they never have to come down. The backyard was a different story. There were 3 massive pine trees that were actually planted for the 3 boys that lived here. We lost half of one during a hurricane and the other half went over our large retaining wall into 3 neighbors yards causing us to pray the other 2 didn't follow suit. We recently had the other 2 taken down before they could do it on their own. I got nothing done that day because I was amazed at how those guys work. 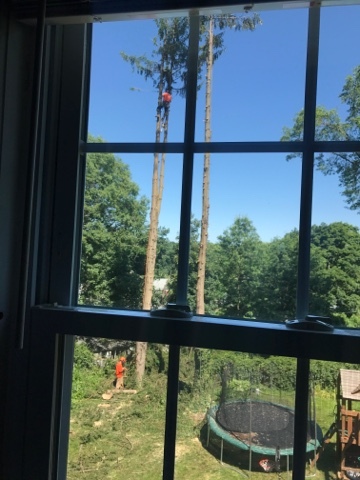 No equipment besides a harness and a chainsaw. I was hesitant to take them down. Not because they were pretty but our yard felt enclosed and what I feared happened...I now feel naked in my backyard and need new trees planted ASAP! Add it to the backyard renovation list. We're in the midst of finally fixing things up and I wanted to share the process of what's going on over here but before we get to that I'll fill you in on what our thoughts were before diving into this project. We plan on eventually adding on to our home. It's a HUUUUGE renovation! 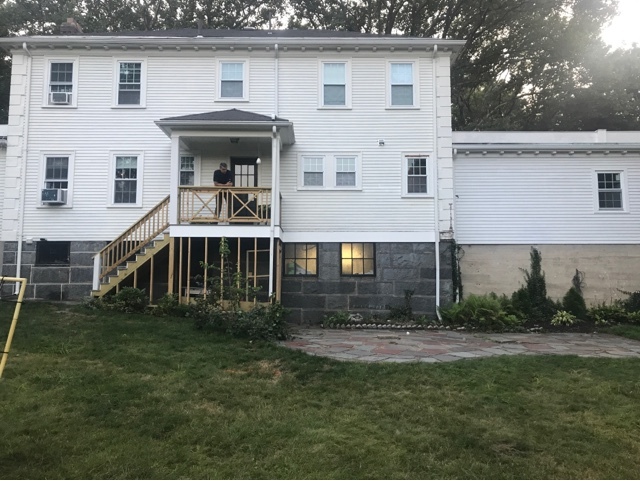 Since we have an exposed basement, we have to add 3 stories and a new garage and that is not happening for awhile but we didn't want to live with our dilapidated deck until we renovated. 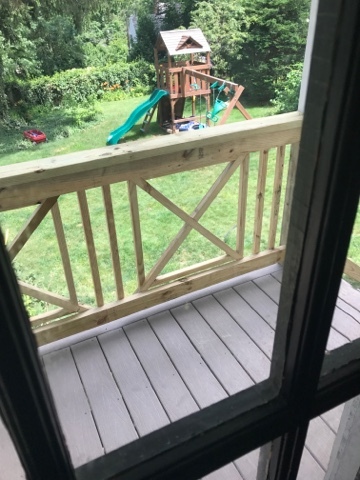 So we had to come up with a solution to make the backyard livable for entertaining and hanging out with the kids but also not go crazy since it will eventually all be ripped up again. 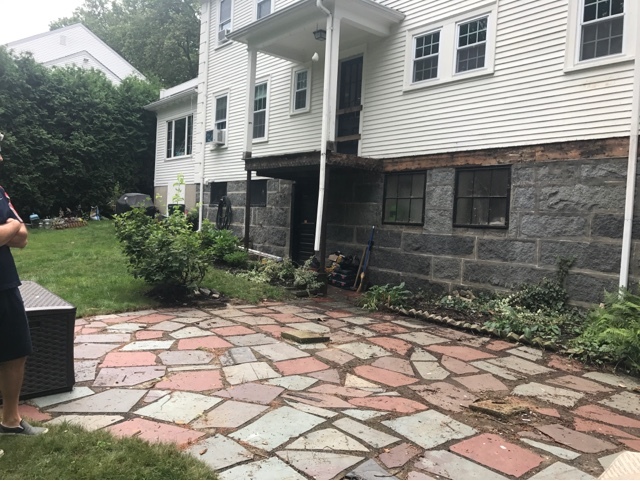 After nixing the idea of building another deck since it wasn't very cost effective we decided to go with a partial stone patio and peastone gravel seating area. I was very hesitant about how the gravel was going to look in our yard but I'm hoping it will all come together nicely. That's the thing about working on the exterior is that you may not see the final outcome until a year or two later when all your plantings fill in and make it the space you envisioned. Here are some before pictures of the back of our house before anything was done. 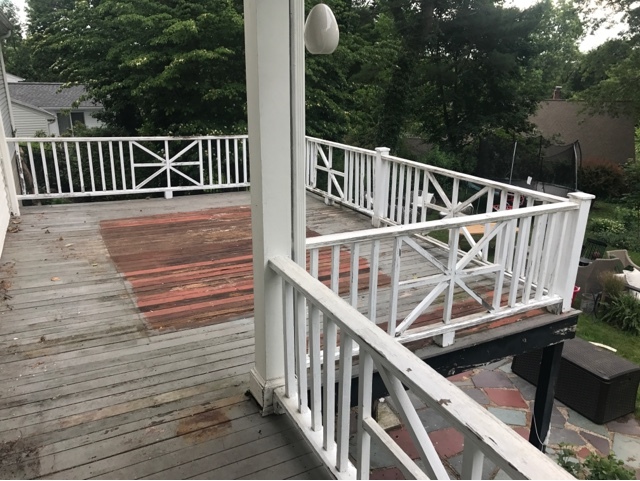 I had painted the lattice black and the decking gray because it was red before that. Even though it was falling down I was trying to disguise the eye sore that it was. 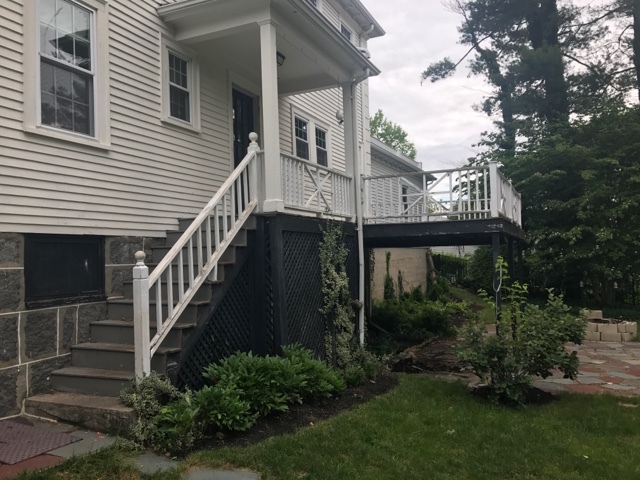 We used gray composite decking for the deck boards and stairs since it was a small area. Normally I'd just go with a pressure treated wood but since it gets lots of use and the area wasn't large we went for the more durable stuff. We removed the deck and had a new smaller portion built with steps which will lead down to the new patio. 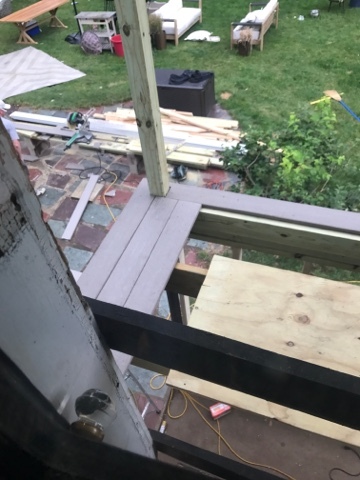 The railing will be painted white and we will be adding horizontal decking below to cover under the deck and the foundation of the house. I'm still trying to figure this one out so it's at a standstill right now and still looks ugly. I debated over the deck railing design for awhile and decided to go with a simple design. The carpenter added a wider ledge too which has come in handy for holding drinks! Stay tuned as I blog more about our #jcdprojectpatio this summer!